After back to back draws, Liverpool managed to win back their place at the head of the table against Bournemouth. Liverpool found themselves frustrated by a heavily packed West Ham defence on Monday, however Bournemouth played into their hands both defensively and offensively, as shown in Georginio Wijnaldum’s goal. Bournemouth attempt to play out from the back but struggle to find a pass forward as Liverpool sit off and flood the centre. Jefferson Lerma passes into Andrew Surman, but Wijnaldum quickly gets tight to him and forces a pass backwards to Steve Cook. 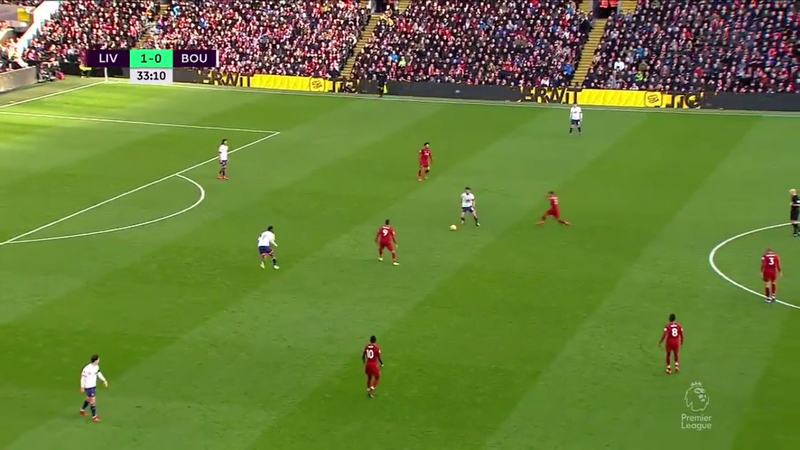 This backwards pass triggers pressing by Roberto Firmino. 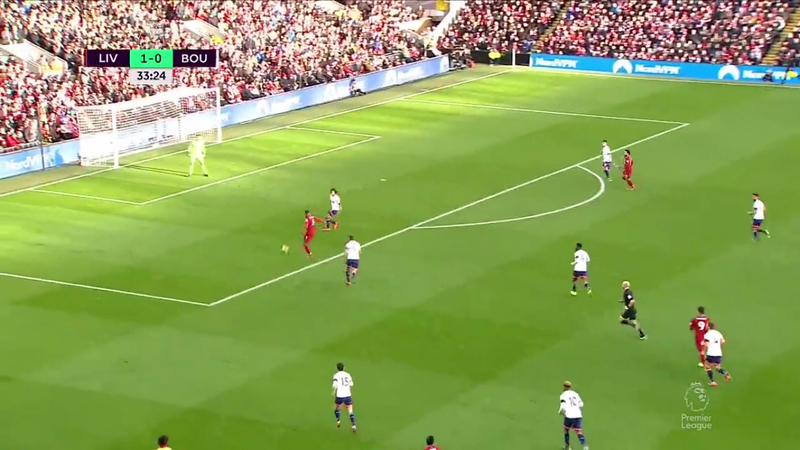 The Brazilian closes Cook down while curving his run to block the pass into Lerma, and Mohamed Salah and Sadio Mane get close to Nathan Ake and Adam Smith respectively to cut off the easy short passes. 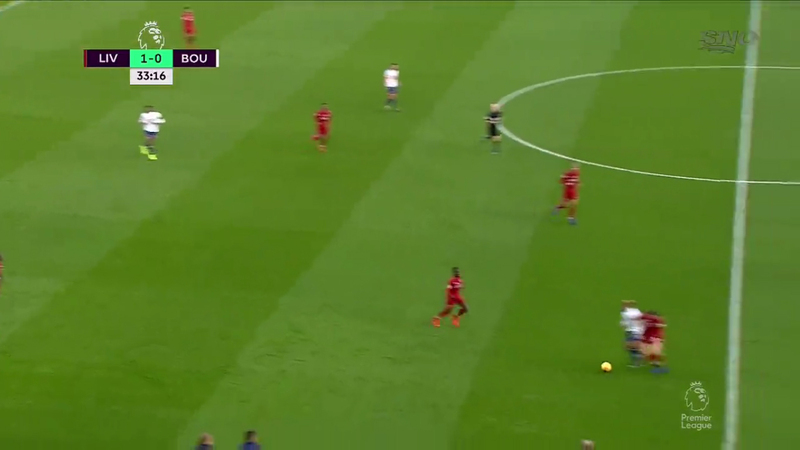 Although initially showing for a pass back to Lerma, Cook confidently strides forward on the ball and passes to Jordon Ibe ahead of him. The former Liverpool man doesn’t get the opportunity to attack though. 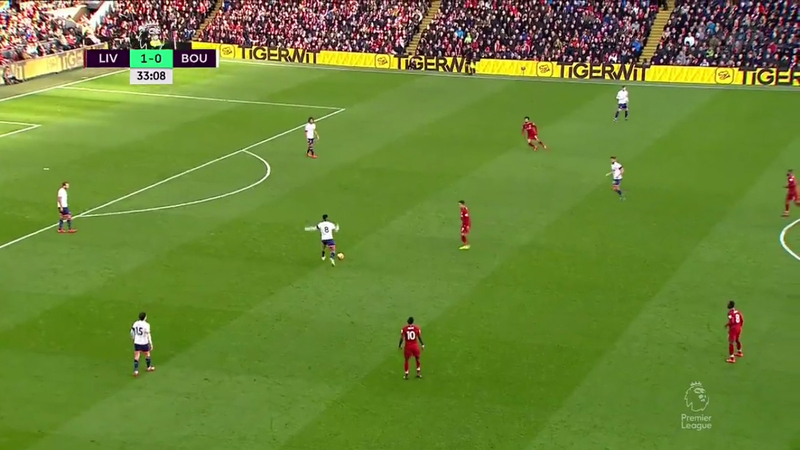 Andy Robertson is immediately on top of him, forcing him backwards and towards the touchline, while Naby Keita also closes him down and Mane and Firmino block the passes back to the defenders. 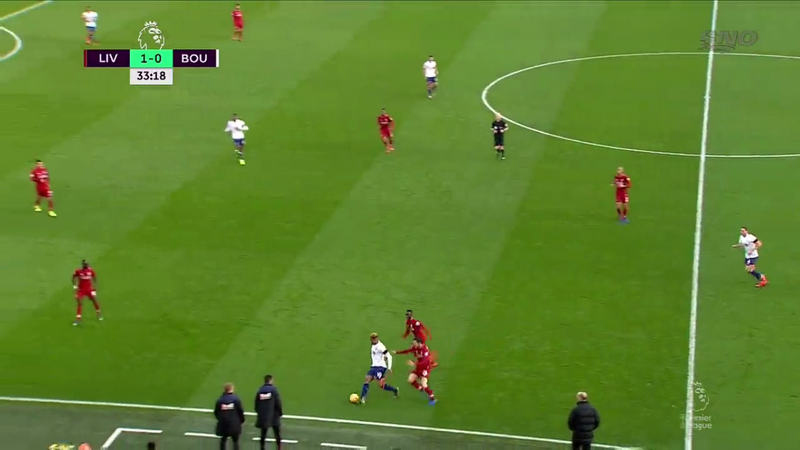 Unsurprisingly Ibe loses the ball, with Mane quickly laying it off to Robertson behind him. With no one able to quickly close down Robertson, the Scot goes to hit a pass in behind the Bournemouth defence. While West Ham got their point on Monday, by keeping a packed backline, Bournemouth’s here is very stretched. 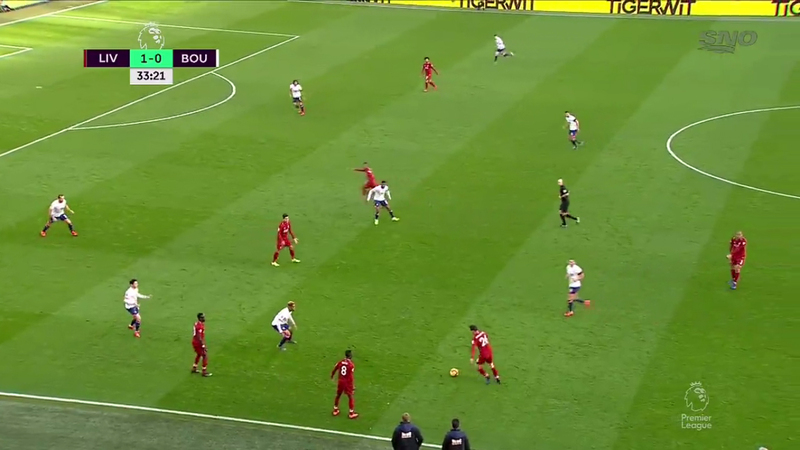 This is firstly because they were attempting to pass their way out, meaning the back four spread wide across the pitch, but once the ball is lost Bournemouth are very slow to react. 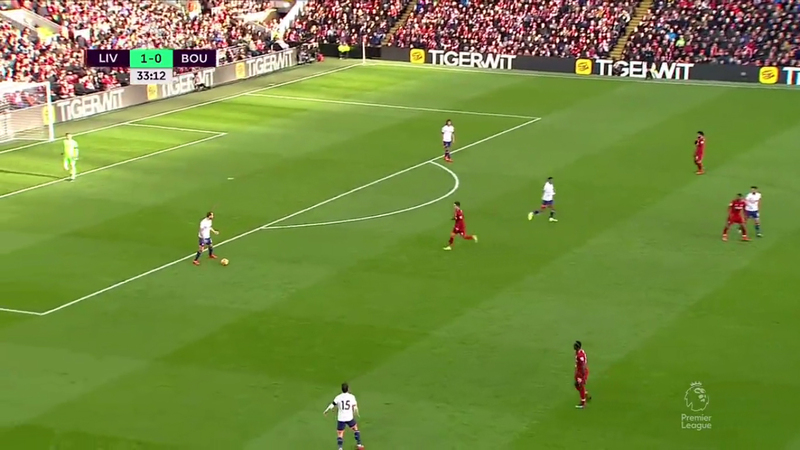 Neither Smith and Cook turn until the ball is already sailing over their heads, while Ake and Diego Rico are only jogging, meaning they aren’t in positions to compensate. Wijnaldum makes a run off the back of Lerma into the gap between Cook and Ake and collects Robertson’s pass over the top. 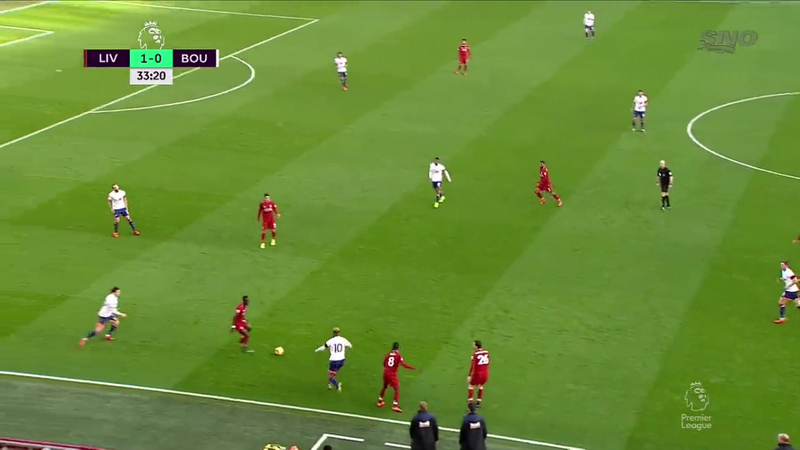 Bournemouth recover well though: Ake comes across into a position to stop Wijnaldum from cutting onto his right foot to shoot or passing across to Salah, Boruc covers the near post, while Rico gets close to Salah so any pass can be cut out. Wijnaldum instead ruins all their hard work by beating Boruc with a perfectly placed lob.